The glacier outlines extracted from a reference dataset (RGI) and are projected onto a local gridded map of the glacier (Fig. a). Depending on the glacier location, a suitable source for the topographical data is downloaded automatically and interpolated to the local grid. 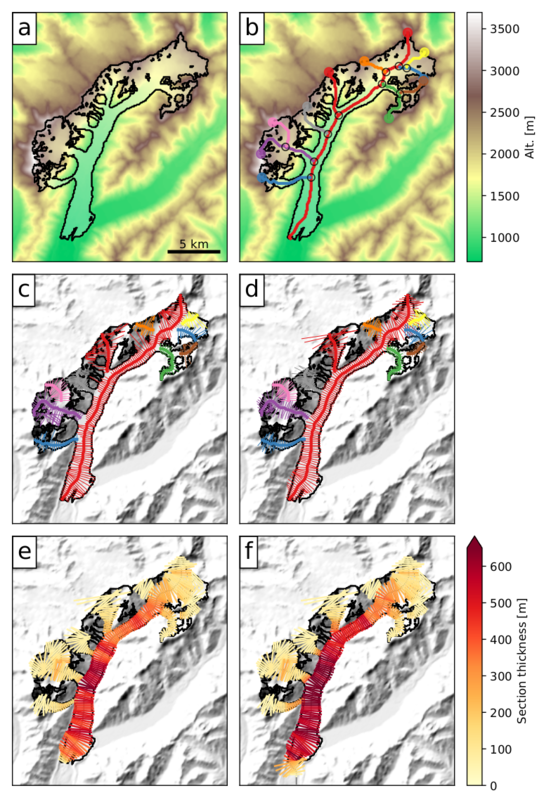 The map spatial resolution depends on the size of the glacier. The glacier centerlines are computed using a geometrical routing algorithm (Fig. b), then filtered and slightly modified to become glacier “flowlines” with a fixed grid spacing (Fig. c). The geometrical widths along the flowlines are obtained by intersecting the normals at each grid point with the glacier outlines and the tributaries’ catchment areas. Each tributary and the main flowline has a catchment area, which is then used to correct the geometrical widths so that the flowline representation of the glacier is in close accordance with the actual altitude-area distribution of the glacier (Fig. d). Gridded climate data (monthly temperature and precipitation) are interpolated to the glacier location and corrected for altitude at each flowline’s grid point. A carefully calibrated temperature-index model is used to compute the mass-balance for any month in the past. Using the mass-balance data computed above and relying on mass-conservation considerations, an estimate of the ice flux along each glacier cross-section can be computed. by making assumptions about the shape of the cross-section (parabolic or rectangular) and using the physics of ice flow, the model computes the thickness of the glacier along the flowlines and the total volume of the glacier (Fig. e). A dynamical flowline model is used to simulate the advance and retreat of the glacier under preselected climate time series. Here (Fig. f), a 120-yrs long random climate sequence leads to a glacier advance.